Now that Sarah Palin has quit once again and her rapid fade from relevance has commenced, we thought it might be fun to memorialize her by re-posting some of our favorite Palin-centric columns and song parodies from the past. Let’s raise our collective glasses and toast the former ex-quitting half-term Governor of Alaska! 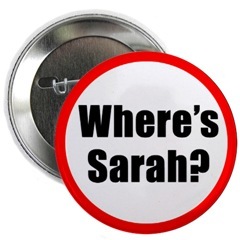 Ah, Sarah, we hardly knew ye! This column was originally posted on October 29, 2010. It comments upon Sarah Palin’s backing away from Delaware senate candidate Christine O’Donnell after it became apparent to everyone that O’Donnell was crazy. 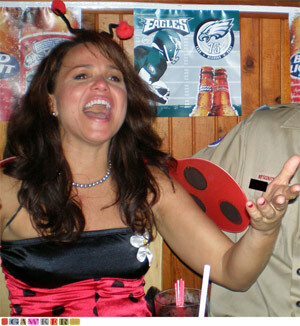 It has been less than two months since Sarah Palin endorsed Teapublican Christine O’Donnell for Joe Biden’s former Delaware Senate seat. On September 8th, the “Queen of Quit” retweeted a tweet from conservative radio host Tammy Bruce to her over 200,000 alleged followers. The tweet said, “@ChristineOD is great, her election must [be] a major focus for us all.” Palin then officially broke the news by calling her Fox News “BFF” Sean Hannity. Hannity then quickly sent out a Twiiter tweet which said, “Thanks @SarahPalinUSA for the last minute call in. Endorsement of Christine O’Donnell was an exclusive. Said she hadn’t told Christine yet.” Immediately thereafter, O’Donnell tweeted, “Just got Gov. Palin’s endorsement! Thank you for your prayers!” Yikes, what a frightening love triangle comprised of Palin, conservative talk radio and O’Donnell. But, a funny thing happened on the way to a joint Palin/O’Donnell campaign appearance. O’Donnell was exposed as an unqualified fool. The whole nation became aware of her “dabbling in witchcraft”, “satanic alter” picnics, masturbation ban, evolution denying, tax evasion, college degree mystery, campaign donation games and finally, her complete misunderstanding of the United States Constitution. Nevertheless, Sarah Palin is a stalwart, loyal and dedicated supporter of her “Mama Grizzlies”. So, what did she do to rehabilitate O’Donnell’s image? Nothing. She quietly faded from the scene and thus far has avoided any attempted joint public appearance. Our advice to Christine O’Donnell? Don’t hold your breath. There are only 3 days left before the election and Sarah Palin has hitched her caboose to the “Tea Party Express Traveling Kool-Aid Show and Freak Emporium”, which will purposely steer well clear of the Blue Hen State. 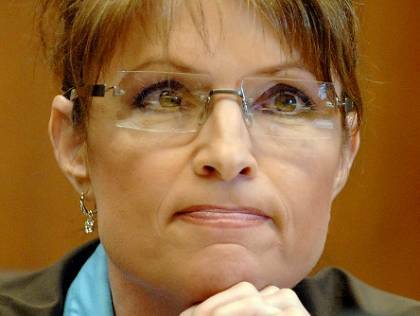 Palin has made it absolutely clear that O’Donnell is persona non grata (btw, for you G.O.P. readers, persona non grata means “an unwelcome person”). This is not surprising. 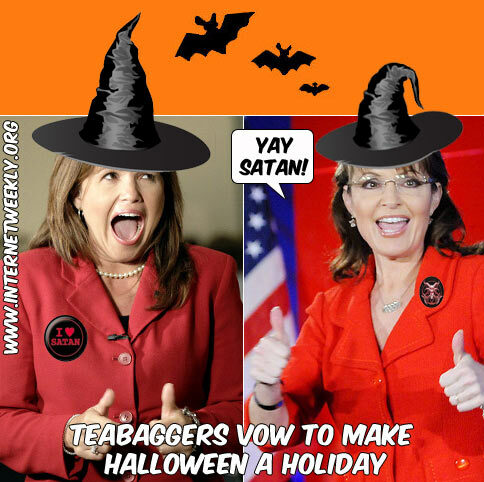 Sarah Palin changes her allegiances as often as she changes her Naughty Monkey heels. When is the last time you heard her mention Meg Stapleton, Ivy Frye, Kris Perry, Kristan Cole or even Carly Fiorina and Meg Whitman for that matter? Palin is fickle and loves front-runners and unfortunately for O’Donnell, the flavor of the day is Joe “computer tampering” Miller and Sharron “2nd Amendment remedies” Angle. Don’t believe it, Christine? Then try contacting Sarah by telephone and see if she will “get back to ya on that”! Face it, Christine. You are on your own till Tuesday when you become a footnote in history. Here is a little advice until then. You might consider resisting the urge to don your lady-bug costume, get blasted and go on a manhunt this pre-election Halloween. You already carry enough baggage. In honor of the troops, please click on the song link below to familiarize yourselves with the tune and to have more fun singing along to this Halloween inspired parody. Let me tell ya brother, she’s been sleeping in the Devil’s bed. BREAKING NEWS: Orly Taitz, the dentist, real estate agent and attorney has had another of her “birther” lawsuits dismissed. 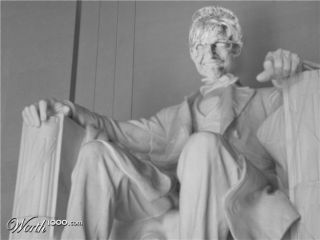 Judge Clay Land of the U.S. District Court for the Middle District of Georgia has dismissed Connie Rhodes vs. Thomas D. Macdonald which sought to prove that President Barack Obama is not a natural born American citizen. Additionally, the court deemed the case to be frivolous and threatened Taitz with sanctions should she commence another such action in his court. Let’s hear it for the judge. THIS JUST IN: Fox News has embarrassed itself once again. This week the Republican voicebox network took out newspaper ads the subject of which was last week’s crazy Tea-Bagger march in Washington D.C. The ads stated, “How did, ABC, CBS, NBC, MSNBC, and CNN miss this story?” Problem is, nobody missed it. All of the major networks covered the event. Fox News simply cannot be trusted to tell the truth. Now Fox, go wash your mouth out with soap. BREAKING NEWS: Rush Limbaugh has just jumped back aboard the racism bus. In fact, he now claims that America should go back to racially segregated buses. Speaking about an incident last week in which a white boy was beaten by black boys while on a bus Limbaugh said, “I think the guy’s wrong. I think not only it was racism, it was justifiable racism. I mean, that’s the lesson we’re being taught here today. Kid shouldn’t have been on the bus anyway. We need segregated buses — it was invading space and stuff. This is Obama’s America.” Do I see an advertiser boycott coming? THIS JUST IN: Tammy Bruce was on The O’Reilly Factor last week and said, “But ultimately, it comes down to his inability to govern, and the fact that he seems to have, it seems to me, some malevolence toward this country, which is unabated.” Honestly, Where does Fox find these morons? BREAKING NEWS: A Kentucky high school football coach used a school bus to transport 9 of his players to his Baptist Church to be baptized without seeking consent of their parents. The school district took no action because it insisted the trip was voluntary. Now, there is a case of separation of church and state for you. I wonder what that particular school district’s position was concerning Barack Obama’s speech to school children last week? THIS JUST IN: A panel of three federal appellate judges, all Republican appointees, has ruled that U.S. citizens who were held without charge during post-9/11 terror investigations can sue then-Attorney General John Ascroft for unlawful imprisonment. The Court ruled that Ashcroft violated the right s of citizens held on material-witness warrants when the government lacked probable cause to arrest them. The Court sai the detention policy was, “repugnant to the Constitution.” Will Fox News‘ Sean Hannity and Glenn Beck report about and condemn these actual U.S. internment camps or will they continue to simply fabricate a rumor that Obama wants internment camps? BREAKING NEWS: CNN reports, ” Former Arkansas Gov. Mike Huckabee won the Values Voter Summit’s 2012 presidential straw poll Saturday, grabbing nearly 29 percent of the vote in a crowded field.Former Massachusetts Gov. Mitt Romney, Minnesota Gov. Tim Pawlenty, former Alaska Gov. Sarah Palin and Indiana Rep. Mike Pence each won roughly 12 percent of the 597 votes cast.” See the rest of the story, here. Poor Sarah Palin. THIS JUST IN: The $ 63,500.00 question is, “Who is this Cathy Maples of Huntsville, Alabama, the high bidder in the Have Lunch With Sarah Palin auction on Ebay?” Enquiring minds want to know. Please remember to click on the song link below to familiarize yourselves with the tune and to have more fun singing along to this Sarah Palin song parody also, too. Represents the brand new G.O.P.